BANGKOK (Reuters) - Thais will buy a million cars in 2018, a second year of strong sales, but growing household debt and an anticipated interest rate hike - potentially on Wednesday - spell a slowdown ahead for one of the country's main economic drivers. The auto sector, accounting for one-tenth of Thai output, is a bright spot in an economy impacted by falling integrated circuit exports to China amid Sino-U.S. trade dispute, and fewer Chinese visitors after dozens of tourists died in a July boat accident. Four years of contracting car sales ended in 2017, when the number rose to 871,650 after a five-year ban on selling cars bought under a government subsidy scheme was lifted. "Sales are so strong that we have revised up this year's target twice," said Surapong Paisitpattanapong of the Federation of Thai Industries' auto division. "We should see a million cars this year." But analysts doubt the strength will last. Thai households are among Asia's biggest borrowers - owing some 77.5 percent of gross domestic product - and the central bank looks poised to hike rates at Wednesday's meeting or the next one. Recently, lending for car-purchases has surged, helped by offers by some finance and leasing firms to approve loans within an hour. In July-September, auto loans rose 12.5 percent from a year earlier, the fastest pace since 2012. But delinquencies are high too. At the end of September, 7.32 percent of total current car loans were one- to three-months overdue. Bad loans could rise if there are interest rate hikes. These will "increase our cost of funds, affecting our margins and probably customers," said Tirachart Chiracharasporn, an executive at Thanachart Bank. 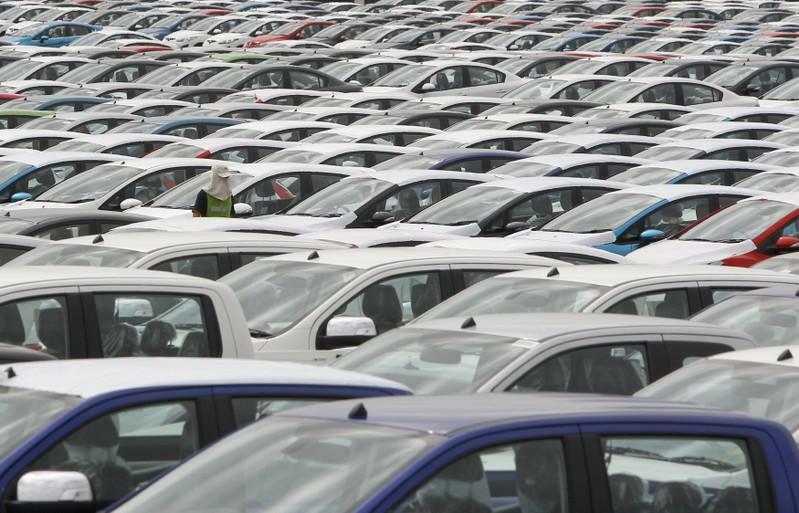 The research unit of Kasikornbank predicts car sales this year will rise 18 percent but then shrink 2-5 percent in 2019. Komsorn Prakobpol, head of Tisco Securities' strategy unit, sees growth next year but only of 5 percent at most. "Banks may get tougher on lending on concerns about loan quality," he said. Sales hit 1.44 million units in 2012, when the government car subsidy ended, so carmakers are still operating below that capacity and are in no rush to expand. "We can manage the current growth with existing resources ... the whole market is still below (peak)," said Jean-Yves Jault, spokesman for Toyota Motor <7203.T>. But there are tweaks in strategy. Carmakers are shifting to hybrid electric vehicle (HEV) production, with the government providing tax incentives for the more eco-friendly cars. Toyota Motor Thailand is planning to begin production of HEV batteries in mid-2019 for its C-HR model, Jault said. Thailand's Board of Investment has also approved electric vehicle projects by Mercedes-Benz , BMW , Nissan Motor <7201.T> and Honda <7267.T>. Overall this year, market leader Toyota - with about one-third of the Thai vehicle market - forecasts its sales growth of 31 percent, while rival Mazda <7261.T> expects 27 percent. But consumer confidence, which fell to six-month lows in November, does not bode well, car dealers say. "People who want to buy don't have much spending power," said Sumete Patchuttorn, managing director of Mazda Mahachai. Prospective buyers like Panaschai Kongmun are thinking twice. "I have to see if I can afford it," said the 25-year-old company worker as he eyed a 900,000 baht ($27,450) Honda Civic. "The economy is not good now, I may have to say no".